Garlic Mushroom Pasta smothered in butter and shredded Parmesan cheese. Sometimes, the simplest of the recipes are truly the best! The recipe takes only 30 minutes from start to finish. 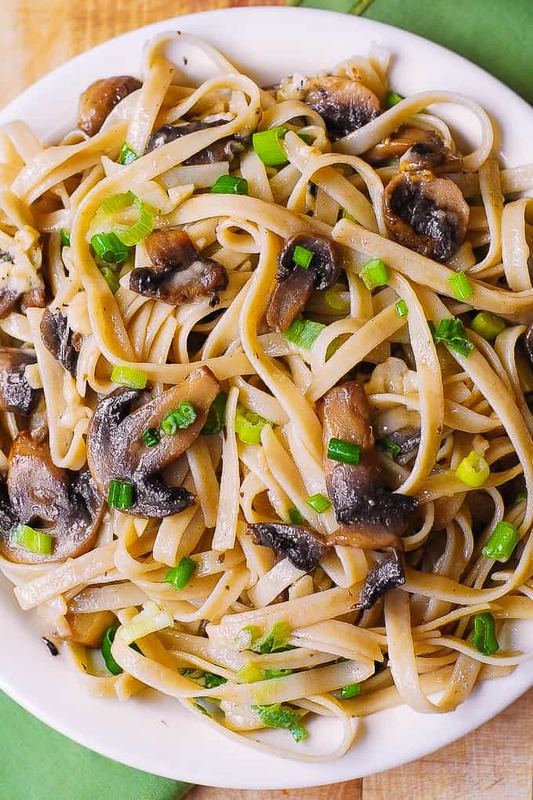 Sliced mushrooms and minced garlic are cooked in olive oil and butter and then tossed with cooked fettuccine pasta and shredded Parmesan cheese. Chopped green onions on top are so good. You’ll love the simplicity of this meatless recipe. While this mushroom pasta is great as a meatless main dish, you can also serve it alongside with the grilled chicken, salmon or steak! If you’re gluten free, brown rice fettuccine works great in this recipe! If available, use truffle salt – it tastes wonderful with mushroom pasta! And, the best thing about this recipe? 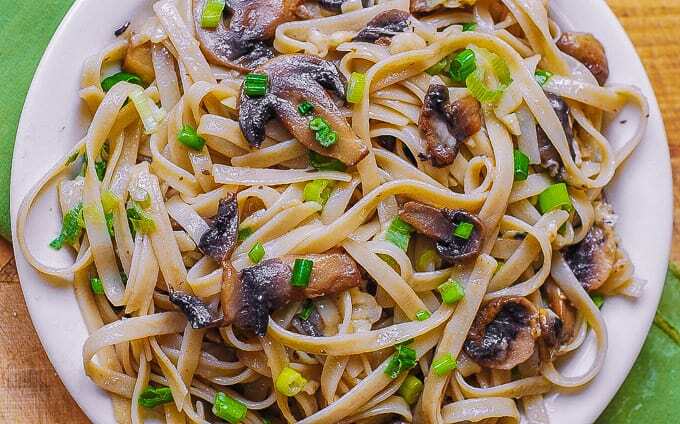 This mushroom fettuccine pasta recipe takes only 30 minutes to make, but the resulting dish tastes like something you would order in a high-end Italian restaurant! Regular, white button mushrooms. These work great in this simple recipe! Using just enough salt, Parmesan cheese, and chopped green onions brings out the best of flavors out of any type of mushroom. Cremini mushrooms. Also called baby bella mushrooms, cremini are similar in size to white mushrooms but are brown. Shiitake mushrooms. Shiitake have “meaty” flavor and will add depth and substance to your pasta. Portobello mushrooms. Use these for adding “meaty” flavor to your pasta. Mushrooms are the star ingredient in this recipe, so it’s important to cook them properly. 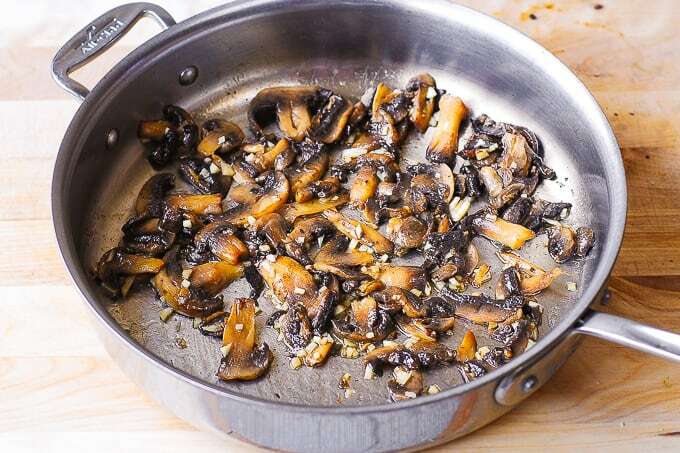 Make sure you saute and brown the mushrooms instead of steaming them in their own juices which can easily happen. Below are some tips for how to cook mushrooms the right way. Use a large skillet. You want to cook mushrooms in a single layer over a large surface, which is why a large skillet or a wide pan will work great. Spreading the mushrooms over a large surface area during cooking will allow liquids to evaporate quicker and will help brown the mushrooms. Use high enough heat. Use high heat on stove top to make sure you saute the mushrooms and not steam them in their own moisture that they will release under heat. Use both olive oil and butter. Heat 1 tablespoon of olive oil and 1 tablespoon of butter over high heat, and cook sliced mushrooms, without overcrowding, for about 5 minutes, turning them a couple of times. Do not overcrowd the pan. Otherwise the mushrooms will steam in their own juices instead of browning. Add salt. Sprinkle salt over the mushrooms in the skillet. Salt helps draw the moisture out of mushrooms quicker, which will make the cooking process shorter and easier. Allow moisture to evaporate. As you’re cooking the mushrooms they will start to release moisture. Keep heat on high to allow moisture to evaporate quickly. Using a large skillet will help this, too. Keep the pan moving. Toss mushrooms a couple of times as you’re cooking to brown them from all sides. Do not rinse pasta after it’s cooked. The starch in pasta will help absorb the sauce made with butter and Parmesan cheese. Reserve some cooked pasta water. You might want to use just a small amount of pasta water (1 or 2 tablespoons) to add to your simple pasta sauce made with butter and Parmesan cheese. Make this recipe gluten free. Simply use gluten free fettuccine noodles (or any other kind of gluten free pasta). Brown rice fettuccine is a great substitution. Truffle salt is more affordable (and easier to manage) than truffles, and it lasts forever. Use truffle salt to season the final dish to add subtle truffle flavor. Season generously with just enough salt. Adding just enough salt allows all the flavors to come together: mushrooms, Parmesan cheese, garlic, and butter. Make sure to season your mushroom pasta with more salt, if needed, to suite your taste. Mushrooms and pasta go so well together. It’s one of my favorite combinations. Here are some meatless recipes I’ve made in the past that you might enjoy. All of these have mushrooms and pasta as main ingredients but they also involve other big flavors. All of the below recipes also use cream-based sauces. For example, you can combine mushrooms with the homemade tomato vodka sauce just like I did in this Penne Pasta in Creamy Vodka Tomato Sauce with Mushrooms. Or, use sun-dried tomatoes, basil and garlic to complement pasta and mushrooms in this easy Italian-style Creamy Mushroom Pasta with Sun-Dried Tomatoes. How about combining spinach, shiitake and caramelized onions? It surely worked in this Creamy Mushroom Spinach Pasta with Caramelized Onions. Enjoy this recipe and please leave your feedback (with the star rating) in the comments section below. You can also share the picture of your dish by tagging me via my Instagram account. This meatless Garlic Mushroom Pasta with butter and Parmesan sauce takes only 30 minutes to make. 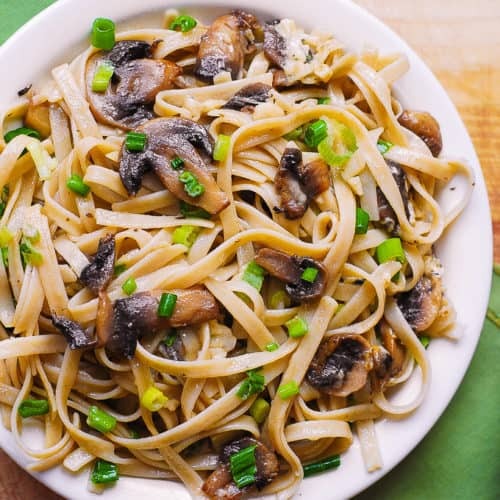 Sliced mushrooms and minced garlic are cooked in olive oil and butter and then tossed with cooked fettuccine pasta and shredded Parmesan cheese. Heat 1 tablespoon of olive oil and 1 tablespoon of butter in a large skillet on medium-high heat. Add sliced mushrooms and minced garlic. Sprinkle with about 1/8 teaspoon of salt. Cook for about 2 minutes, constantly stirring, until mushrooms are soft. Taste and add more salt, if needed. Remove from heat. Cook pasta according to the package instructions. Rinse and drain. Note about gluten free pasta: If using gluten free pasta, rinse it in cold water and drain to prevent it from getting mushy. Add pasta to the mushrooms along with 4 tablespoons of butter. Add the remaining 1/4 teaspoon of salt. Gently reheat until butter melts and pasta is very warm. Add grated Parmesan cheese, continue to reheat pasta, stirring until cheese melts. Definitely add more salt than what I indicate here (I am being conservative) to suite your taste – adding just enough salt (not too much but not too little either) allows all the flavors to blend together: mushrooms, Parmesan cheese, garlic, and butter. 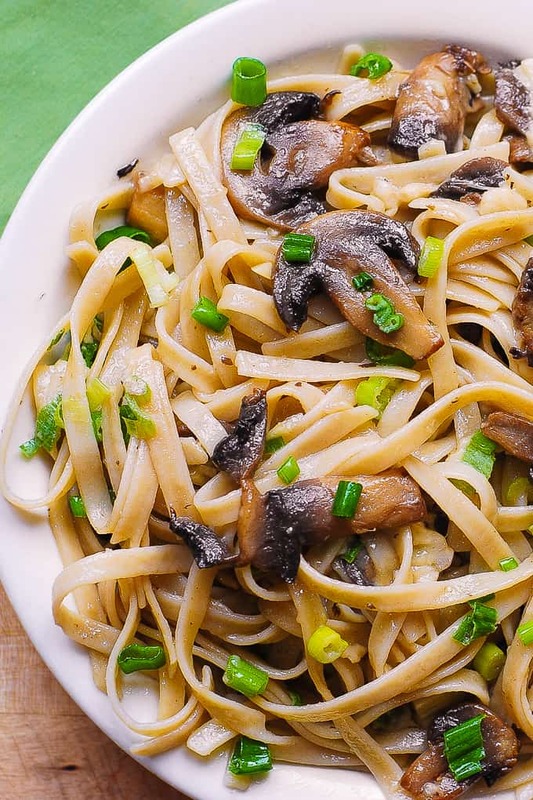 Serve mushroom pasta topped with chopped green onions. Note: if available, use truffle salt - it goes great with this recipe. This recipe was originally published on November 12, 2014 and republished with updates and cooking tips in June 2018. This dish was delicious! Do you have the nutritional information? I’d like know understand how many miles I need to run after eating it! Your pasta dishes always make my mouth water!! I love mushrooms like this! The pasta sounds like the perfect complement. Brown rice fettuccine seems like a great substitute. Yum! 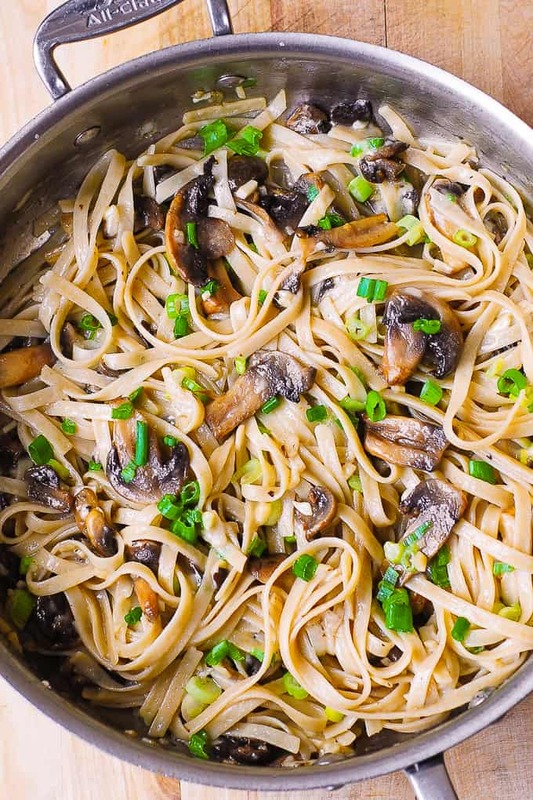 I can never turn down mushrooms in pasta – this sounds and looks fantastic! Wow! This looks spectacular! Great combo of flavors, yet such an easy dish. Thanks! sounds fantastic! i made your chicken mozzarella pasta recently and it was divine!